Our snow plow was built by Russell in 1921 for the Boston & Maine railroad. In 1960, it was sold to the Wellsville, Addison & Galeton, a shortline comprised of former Baltimore & Ohio branchlines in New York and Pennsylvania. 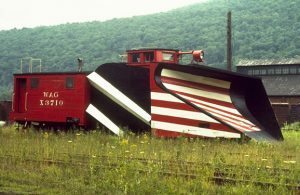 After the WAG shut down in 1979, snow plow X-3710 was sold to a private individual in 1982 who repainted it into a version of B&M decoration. The plow was purchased in 1997 and donated to the R&GV in 1999. After careful evaluation, a slow and steady restoration and stabilization process was started, led by the Marks family. This item is currently not on public display. Built in 1921 by Russell Snow Plow Co.